In these photos, you’ll see I used the packaged Moulard duck breasts. I also purchased a whole duck, as I had plans for the other parts. 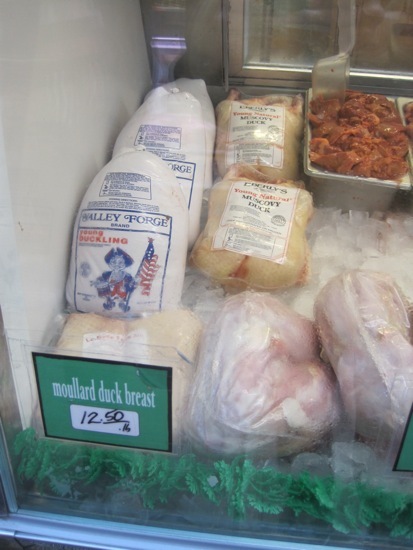 I realize I was fortunate – here in Washington, DC, Eastern Market has duck almost all the time. Some of my favorite farmers also have duck from time to time, although they are less likely to have it at this time of year. The two Moulard duck breasts were started eight days ago and unwrapped and served this afternoon at a lazy lunch (see above) as part of a larger cheese and charcuterie presentation. I broke down the whole duck, making more prosciutto with those breasts – they’ll be ready next week. With these, just for fun, I flavored one with ancho chili and soaked the cheesecloth in tequila. The other is wrapped in fresh thyme and the cheesecloth was soaked in Armagnac. I have no idea how they will come out, but, it seemed like a good idea at the time. 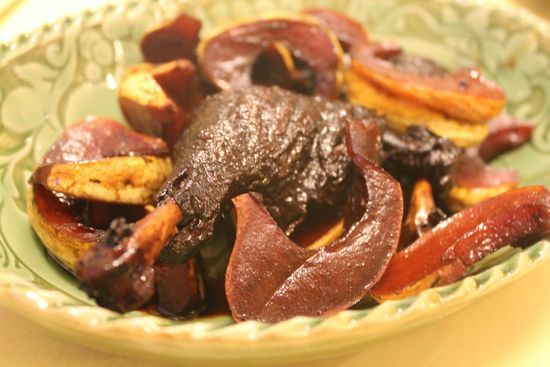 With the rest of that duck, I made Red Cooked Duck with the leg quarters (OMG wonderful.) I made a teeny tiny duck liver terrine with apples, rendered all the fat for potato roasting and frying (YUM) and, then, with the carcass, Autumn Stock from Amanda Hesser’s lovely cookbook The Cook and The Gardener. Ultimately, that stock will be used for chicken and dumplings or chicken pot pie. You’ll need kosher salt, cheesecloth, twine and a scale. Ruhlman suggests flavoring with white pepper. I’ve used – at different times – white pepper; fresh thyme; lemongrass with Kaffir lime; juniper and allspice; and, Chinese five spice. Each imparts a glorious taste to the meat. 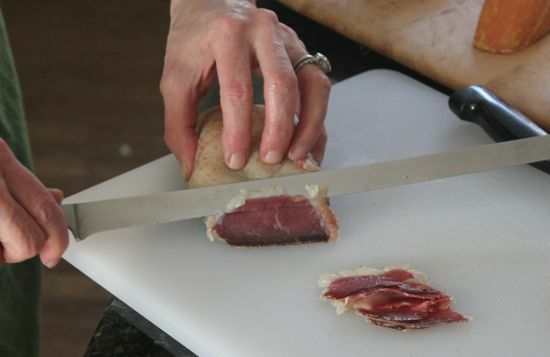 After reading the recipe and exploring the photos on Ruhlman’s post about duck prosciutto, I noticed he scored the duck breast, as you might if you were cooking it fresh. This makes perfect sense, as you want the salt to be absorbed into the flesh – so make sure to score before you slather on the salt. Note that you may need up to 3 cups of salt. Finding the perfect container for the two breasts, ensuring they are not touching, but still snug, will keep the salt use in check. 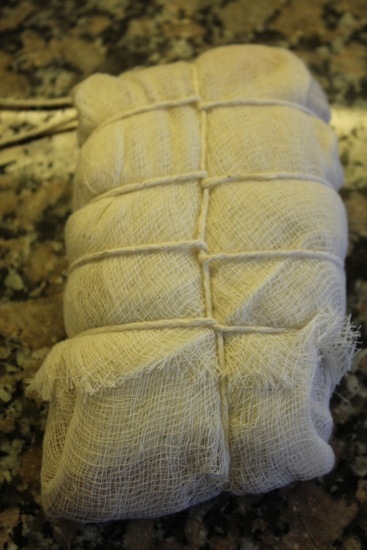 I wrapped the duck in cheesecloth after a day basking in the salt, weighing each breast first. I hung them in the garage (keep the twine ends long enough to tie to a hook, rafter or, in my case, the steel shelf edge. In the past, I’ve allowed the duck to cure too long, seeking the firm flesh noted in the book. Results were mixed until I started weighing before and after, watching for a 30% reduction. I couldn’t find masking tape anywhere. Christmas tags were abundant. Truly, this couldn’t be easier. Your duck proscuitto is ready. Serve it as an elegant appetizer sliced very very very thin. Something bubbly – champagne or prosecco – is nice alongside. Gently turn and knead the dough until it’s smooth. Try to add as little additional flour as possible, as adding flour at this point can make your crust heavy. Don’t worry if it’s a little sticky. Turn to coat in the oil in the bowl, then cover and allow it to rise for an hour. Note: I often make pizza crust as far as two days ahead, and allow for a very slow cold rise in the refrigerator for a more sour, developed taste. I’ll spray the inside of a zip lock bag with PAM and then put the dough in the bag, zipping it almost all the way closed and refrigerate. Do leave the bag partly open as the dough will expand and you’ll hear a loud THUD from the fridge at some point, when the bag explodes! The dough should be at room temperature. Place pizza stone in the oven to heat up at least 30 minutes before baking. Form your pizza dough into two rounds or rectangles or whatever shape you like. Schmear pesto across the pizza dough, or drop by the tablespoon here and there. Leave the edges bare. Fan out the potato slices across the pesto. Divide the duck proscuitto between the two pizzas. Scatter the mozzerella pieces over the top. Add a pinch of crushed red pepper. Brush the edges with olive oil. Slide the pizzas into the oven for 10 minutes. Slide the pizzas out, quickly dress the top of the pizza with the arugula making a little nest in the center. Crack one egg at a time into a small bowl. Carefully snuggle each egg into the nest of arugula, drizzle the whole thing with olive oil, and then carefully slide the pizzas back in the oven. Bake an additional 6-8 minutes, until the egg is cooked to your liking. As soon as the pizzas come out, sprinkle the egg yolk with good salt and shave parmesian curls over the top. Serve. So it came out good? I’m glad someone succeeded. Our’s was a complete fail. It was rubbery and tasted really salty. I’m jealous of your duck proscuitto pizza. It sounds delicious! It was wonderful. I’m sorry to hear your duck prosciutto was rubbery. I had similar results at first, but have learned a few tricks. I would guess the space you had your duck hanging was not humid enough. It shouldn’t be a sauna, but some moisture in the air is important. Also, I don’t know if you used a scale, weighing the duck breast before and after, but that has been a much more consistent way to know when the duck is ready. I think it’s easy to over cure and get that rubbery result. Salty? That’s a surprise. 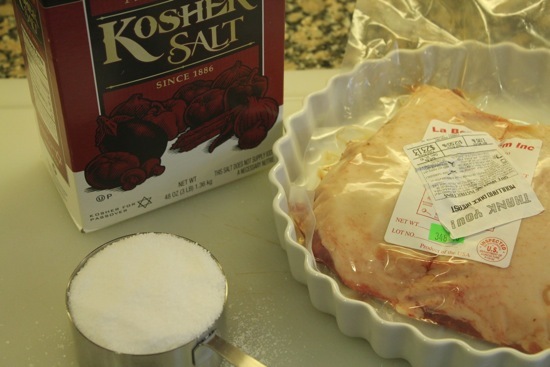 Did you use kosher salt? I think we will try again soon. We will try fiddling with the humidity next time. That’s a good suggestion. Can’t wait to see what you are making next! I just stareted my DP and after wrapping and hanging i realize i forgot to hit it with white pepper…Is this a deal breaker? and what brand of kosher salt, Cyrstal Diamond weighs out different than Morton by a fair amount. The density will vary depending on the size and shape of the crystals. But if you weigh the salt it won’t make a difference. In a pinch (sorry) you can even use canning or (preferably non-iodized) table salt though they don’t stick to the meat surface as well. Great Post…Love your Duck Carbonara Pizza. The peppery arugula pesto and chives in the dough are really nice touches. Finishing with the egg to compliment the Duck Prosciutto – I’ve got to make this!!! Gorgeous. The only duck I could find was frozen, so I’m eagerly awaiting a thaw so I can start. Curious if the whole duck you bought was the Valley Forge brand? No, the whole duck was to the right of the Valley Forge – something from the Amish, evidently. No brine. In your reference to the next project, you do want to mention (which your hyper-link doesn’t) that there are two different salts which are pink. People want the one which is sodium nitrite, not sodium nitrate. Both are used in meat curing. Sources, web-sites and brand names can be found in Charcuterie under the heading Sources. In my edition page 301. My wife is still working on what to do with the duck prosciutto, I only cure the meat, she has to do something with it. Congratulations on your success! I thought it might be too warm in Florida to try this venture; although recent weather experiences have proven me wrong. The photo of the sliced duck prosciutto is divine and I must say that the Christmas tags gave your duck the perfect touch! I applaude you in all you do. You always go above and beyond the norm. Can’t wait to read more of your posts throughout the “Year Of Meat”! Your duck prosciutto looks truly amazing! You make this seem so easy! I’ve never had duck prosciutto, but it looks divine. I can imagine what a nice little appetizer it would make along with some bubbly for New Years Eve. I love how you not only made the prosciutto, but you used up every part of that duck. Industrious, and respectful of the animal. That Duck Carbonara Pizza has me drooling all over this keyboard. Perhaps if I make sure the heat won’t kick in, I’ll open the windows and hand the ducks from the dining room chandelier? Gail, I will cure one extra for you and bring it to NY the next time I see you. The thought of duck hanging from the chandelier and Mitzi leaping off the table to get at it? Not pretty. Those are some HUGE duck breasts. and that spread looks amazing. Duck prosciutto is really one of the easiest and best cured meats, never goes wrong. I also like to treat it like pancetta (more pepper) – turns out great. Sauteed they get nice an crispy! Going to buy a wine fridge today, just because my garage creeps me out. Also buying the duck to get the fun going. Good way to start the year. Ok – so another question for you: the pre-dried weight you use: is that pre- or post- salting? My breasts lost 20-30 grams in the overnight salting step, so I just want to make sure I’m using the proper original weight to calculate my 30% moisture loss. And wow – don’t take this wrong way, but your breasts are huge . My largest one was only 200 g.
I weighed post salting, but I’m not sure what Ruhlman means in the book. Maybe he’ll chime in? My past experiences weighing post-salting and seeking a 30% reduction in weight have turned out well. As to the size of my, um, breasts, yes -agreed – enormous. Most I’ve seen before this have weighed between 225 and 250g. Silvana – I would bet the greatest difference between your wild ducks and my farmed ones is probably in the layer of fat on the breast. Because there is less fat, your duck may be fully cured more quickly than seven days. This is just a guess – I have no experience with wild duck. Anyone? Thank you Cathy for taking the time to respond to me, I kind of thought that might be the case. I would love to have more feed back from anyone else that has experience with wild duck, if anyone is reading the comments. I will go ahead and start in the next couple of days anyway, following the recipe for curing, I don’t want to wait too long – duckies are ready to go in the fridge… Maybe I will have to weigh the breasts more often? I’m using wild ducks for this, too. Wild ducks are much smaller, leaner, and deeper in color and flavor than the domestic ones, and have no fat to speak of (which rules out making duck confit, unless you’ve got some fat from a domestic bird on hand, or you use another type of fat). The bonus with the wild ducks is that they came with feet included, for better broth! Mine are now in the salting phase, to be wrapped and tied this afternoon. It took six breast halves to get 17.3 oz., and I’m planning on checking them more frequently, too. I’m keeping the salting time to 24 hours; I wondered if it could be shortened, but decided against it. One other thing- with wild ducks and other game, be sure to check very carefully, all throughout the meat, for any stray shot pellets (you can break a tooth on them). I look for flesh wounds, but find the best way is to pinch meat throughout to feel for it. 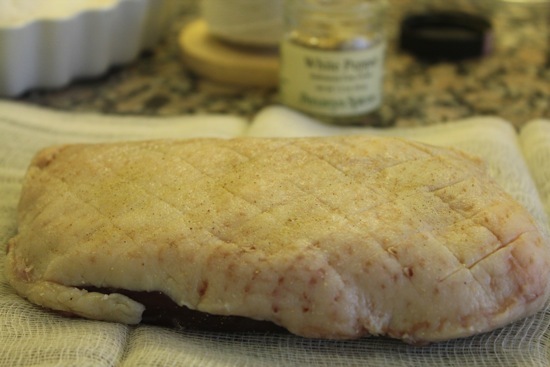 i’ve done wild duck breast and yes it cured a bit quicker in terms of getting a platable textured product – never really got the 30% reduction without getting them to a pretty leathery final product. Best thing I had from wild duck honestly was duck confit pot pie from mostly gizzards (cleaned before confit) and hearts -truly astounding. Thanks for the note, trinichad. My wild duck breasts took 5 days to reduce by 30%, but came out extremely salty and rather dry. My guess is that with the smaller size, and without that thick layer of fat less time was needed in the initial salted process. So I’ve been soaking them to draw out the salt, and using them that way. They made a lovely carbonara, and I think that they will be very good minced and used in a stuffing for duck or perhaps a chicken. The backs were used for broth, and the meat picked from them made a nice filling for ravioli, minced fine as you would for braised beef ravioli. By adding previously rendered duck fat to the legs and thighs, I was able to make some -also truly astounding- confit and served it on polenta. Photo just added to flickr. Ruhlman said that scoring the breasts wasn’t at all necessary and didn’t need to be done, he just did it out of habit. I think I’ll forgo as well since the end result will be prettier. The workshop off the kitchen has been hovering between 40° and 45° but with this snow we’re getting today… Ah well, just have to let it hang a bit longer. Well Mardi and I are just off the plane from a fortnight in Mexico (including the glorious North – empty with all the hysteric drug-viloence media reports), and this sounds just the ticket. Am getting whole duck today, and will start the process. I heart Ruhlman. Hi there, just wondering if anyone else is doing this in the southern hemisphere, it is about 29C (about 85 F) in Auckland today, and about 90% humidity, it is cooler under the house (if a bit spidery!) but wondering if there are any guidelines re upper & lower temp limits? Waiting on my book to arrive in the meantime…..! Not in the southern hemisphere but on the equator – Borneo. i have some duck prosciutto i made more than a month ago in the fridge right now – despite the admonitions that it doesn’t keep for long and should be frozen i have found that anything i make from the book keeps for a long time under refrigeration. i have had some issues with the volume/metric/imperial conversions in other recipes so am looking forward to seeing how others tackle these issues. I,m sad I don’t have a cool enough place because this would have been a simple project to start with and I love duck… hopefully I’ll be able to do the next one. Oh my, I guess I read the inital page on this incorrectly. I thought the Duck Prosciutto was to BEGIN Jan. 15th. We’re on the road and won’t be home until the 21st. So, guess I have to start with the next project – but, for my own fun, I will do the duck (again) as soon as I do unpack the RV. 🙂 I already have the book and always make my bacon from it and a couple of other goodies. A group of friends spread between Melbourne (Victoria) and Cooroy (Queensland) in Australia are going to join in your wonderful sounding charcetapalooza. Keen to start with the duck prosciutto, but our current summer temperatures preclude the possibility of hanging anything in a temperature remotely like 8degrees celsius. In the absence of a wine storage/cooler is it possible to adapt this to “hanging” in a fridge at a lower temperature? (Could always increase temperature of fridge I guess, he’ll, who needs milk in the face of the lovely sounding prosciutto). This is just thrilling! My best advice is to get yourself a thermometer/humidity gauge and look for the right conditions either in a cool part of your home, in the fridge, and old fridge, or, as I’ve now done, in a second hand small wine refrigerator. Future challenges will not require a curing chamber! My duck breast has been hanging in the garage for a week and only lost 1 oz. of the original 16 oz. I’m in So. California but the weather has been cold. I have a thermometer/hygrometer and the temp has been between 40 and 60 degrees and the humidity also from 40 to 57%. I have no way I know of to raise the humidity. I did pack it in salt for 24 hours and then washed and dried it and wrapped it in cheesecloth and tied it up. I’m wondering if my uncontrolable conditions are going to work for this project? You did get me started and I’ve ordered the book and bookmarked web sites. I’ve been doing pretty well with my sauerkraut and pickles. So far, so good. I started a little late, but the duck is hanging as of last night. I started with 2 breast, 15 and 15.5 oz apiece. They lost 1.5oz in the 24-hour salting alone! I ended up dusting them with Five Spice, rather than white pepper and I’m excited to see how it comes out. I am so glad I found this page. I’m a huge fan of Charcuterie and have made several of the fresh and smoked sausages from the book. I wish I had found you in time for the Duck challenge but alas I’ll have to make it just to eat! Thank you for the well done and fun blog I will be joining in on the Charcutepalooza from here out! Weighed my duck breasts last night. I hung them on the 6th so the 14th will be day 8. Starting weight was 188g and 189g, they both came in at 175g. By my calcs 30% would be 132g so they still have a ways to go. My temps are fairly steady at 55, but my humidity may be high at 70%. With my climate and setup I have a very hard time lowering the humidity. Looks like it could take a almost 3 times as long to get to 132g. Should I go by time or weight? Is there a happy medium? I just broke out my first duck prosciutto and holy WOW is it delicioso! 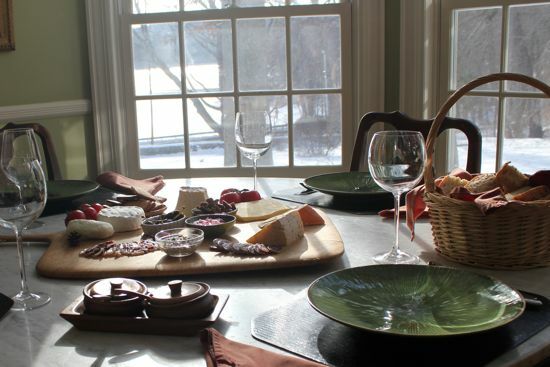 Mom & her sweetie & I are having a smørbrød fiesta (to mix cultural metaphors) with some of the prosciutto, my home-made liver paté, fancy spicy Napolitano salumi, beef tartar, and my own home-made knækbrød with salty-strong blue cheese & quince paste. Nice way to enjoy a blizzard 🙂 Post on blog soon! Just a note to fellow prosciutto makers: My curing environment temperature averaged 45-50, and my humidity ranged from 22-45, not technically ideal, but workable. My breasts were ginormous (ahem), starting off at around 440g, and they air cured, wrapped in quite a lot cheesecloth, for 6 days. I worried that they might not be done, and when I weighed them today, they had lost 12.5% of their weight, rather than the recommended 30%. However, after reading Michael Ruhlman’s post on his blog, I think mine might have had a similarly jerky-like meat side if I had let it cure to 30% weight loss. So, a win for me, and I think it’s just a good indication that the numbers are guidelines and so checking along the way and judging with your mouth is a good way to evaluate whether it’s `done’ or not. mine are hung, for 8 days now but i think they will take longer as i have them hanging in my regular fridge (thank you patient roommates). I have two different sized breasts *insert joke about breasts here* and tried the smaller of the two last night. It was really good- but I’ve decided to let them hang out for a few more days as they still seem too soft to be, er, done. Will try a recipe with the smaller one and post it to my blog the second it is ready. This is really exciting to read about everyone’s experiences this first month! I am investing in a wine fridge for sure. Just an observation that I’ve shared elsewhere: If you used the D’Artagnan magret breasts don’t expect a 30% loss of weight from hanging. Mine had a substantial fat layer so my weight loss was more on the order of 20%. I had very slight dessication on the inner (to the duck) surface of the meat, which I associate with ahving slightly higher temperature and lower humidity than would be ideal (around 59 degrees F and 40% humidity). Oh, right, good point about the fat layer. Mine are magret’s as well, and had a very serious layer of fat. hi all- any advice about cheesecloth alternatives? 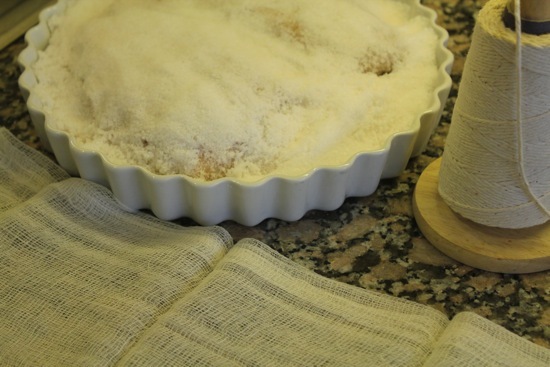 i have a thin dish towel (not terry cloth) that looks as if it breathes well and am thinking of using that instead of cheesecloth. does this ring alarm bells with anyone? Check the posts from Divina Cucina and What Julia Ate – I believe both of them used dishtowels or old clean linens of some sort. thanks! i’m heading there now. Well my husband and I gave this a try and we think it might have gone well but we need some expert guidance. We bought 4 half breasts and packed them in salt for 24 hours, leaving them in the fridge. After that we rinsed them and put white pepper on them, then wrapped them in cheesecloth, tied them and hung them in the garage for a week. After a week they had lost about 15% of their weight. I put pictures of one of the breasts on flickr here (http://www.flickr.com/photos/44646332@N05/sets/72157625725128207/). We tasted it and it was salty but good. Is it finished even though it has only lost about 15% of the weight? Should we leave them in the garage until they have lost more weight or are they ready to come out? The temperature has been warm lately so its probably been between 50 and 65 degrees in the garage. To my utterly untrained eye, those duck breasts look done. Check out the Charcutepalooza Flickr group for more examples, and I think you’ll agree. Just posted this on foodpickle but should have come here! First: starting late – was travelling and just got my breasts last wknd. Second: manic week and started curing the breasts on Monday night but have forgotten to rinse, wrap, hang etc etc!!! So now I am wondering if I should start over or if the breasts will be okay even though they have been in salt for 72 hrs, not 24. Hi Eliz, I’m a little worried about 72 hrs. Will be curious what foodpickle has to say. My initial thought was to soak them in water for a day or two to reduce the salt, then cure them. I’d love to know what happens. Thks Cathy. That’s exactly what foodpickle said too. When I took a look, they were too questionable to risk even doing that. Happily, I started over yesterday moirning and now have two beautiful breasts hanging to cure. Thanks for the great tip about the 30% reduction. Now I just need to learn how to truss as beautifully as you do….! Eliz, some people have found 30% too much, especialiy when working with Magret or Moulard, fattened duck, breasts, when at 25%, they were ready. A great deal can be determined by feel, so make sure to evaluate the flesh side (not the fat side) for firmness after about 8 days. After eyeing your tweets, I’m ready to jump on the bandwagon. Am I right in understanding that if I get my duck going tomorrow I’m not too late? So glad you’re on the meatwagon. You’re not too late! Duck can be cured and posted anytime during the year. 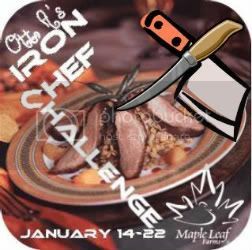 We’re on to bacon and pancetta now (February challenge.) It will be easy to catch up, and you’ll be thrilled with the results. Our family has been curing pork in Calabria (southern Italy) for hundreds of years (both whole muscle and salame); in Italy, cured and smoked meats are vital to eating well and the overall food culture. Glad to see this movement starting up in the US – I think it’s stuff like this that can really change eating habits and ultimately our food culture! Finished the duck prosciutto this week and made a post. Very interesting and educational experience. This was the first item I’ve cured and the modified fridge seemed to work pretty well. Not sure I liked it enough to try it again. Looking forward to giving pancetta a shot. Is there a page that has links to other peoples blog posts about the duck? Also the link in the post above mine for Vince was not working for me. Kim is working on a round up – her post will be up on 1/31. My duck breasts have been hanging for a couple of days now. Their starting weight was over 550 grams each! (Purchased at Eastern Market, btw.) I’m beginning to wonder if I should have left them in the salt longer than 24 hours. Thoughts? The Eastern Market duck I bought were quite large also and one day was sufficient in the salt, with a full eight days of cure before I cut into them. Yay! Finally got mine up & posted! Our breasts didn’t lose the 30% but went for 10 days so I pulled them. I’m guessing I should have weighed them before salting them? Not sure! Should I be worried? My breasts have been hanging for seven days now and have barely lost 15% each (starting weight 340 gr and 358 gr respectively). I’m worried about overhanging and cutting into them too soon. Hi Eliz, Several people have reported similar results. It seems that the larger, denser Moulard or Magret breasts with the significant layer of fat, only lose about 22%. The duck breasts I’ve used from whole ducks tend to weigh less to start, have less fat, and are reliably 30% smaller when ready. Of course, I’ll admit, I’ve made this duck often enough that I’ve learned what the duck feels like when it’s ready. Called mine done today after hanging for nine. They lost between 17% & 18% of their weight. Room was between 50 & 60 degrees the whole time with about 44% humidity. I’m curious how folks keep the prosciutto in the fridge. I just opened up my duck prosciutto tonight – mold! dammit mold! Both white and green. Can I save it? Is wiping the mold off with vinegar enough to make it the prosciutto edible? Whoa. I had some white mold, which I rinsed off with vinegar. Not so sure about the green mold. Are you on Twitter? I’d ask @BobdelGrosso what he thinks. I’m not sure I would eat it, but that’s me being extra-super-cautious. What were the conditions where you were curing? Temp? Humidity? Why do you think there was mold? I am playing catch-up!! 2 duck breasts and 3 goose breasts up and hanging in our wine cellar… perfect environment…. 55 degrees and with the help of a humidifier and a few bowls of water… 71% humidity….. only time will tell! I will let you all know! Forgot to post my completed Duck Prosciutto link. It this the “official” place to put entry links, in the comments of the challenge post? Thanks, John. You can post at the Charcutepalooza Facebook page, too! And don’t forget Punk Domestics. And if you love your recipe, post that on Food52. 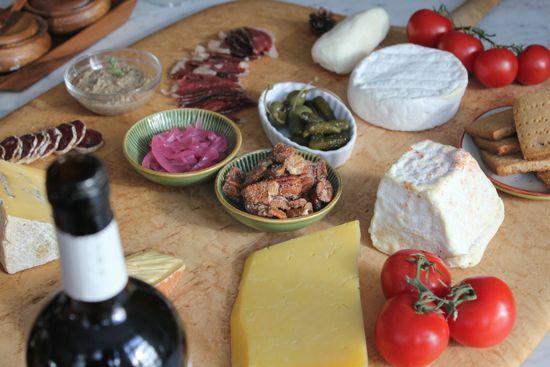 We just love to spread the word about charcuterie. Too gamey tasting prosciutto made for a delicious taleggio and pea risotto. Well, I’m a little late to the party, but better late than never. Posted my experience with duck prosciutto here: http://stickygooeycreamychewy.com/2011/03/02/and-then-there-were-none-the-mystery-of-the-missing-duck-prosciutto/ Unfortunately, there was a little problem with the end result. It disappeared! Literally! What is the ideal temperature range for the duck prosciutto? My apartment is about 70 degrees, and I was going to hang it over a tall pitcher filled with a small amount of highly salinated water (hanging it from a wooden dowel). Has anyone had success in a normal (38-40 degree) fridge? I have a mate dropping off 2-3kg of wild duck breasts sometime this month which I am going to attempt to cure. Being wild they will have little to no fat on them. Any recommendations whether I should cure int he brine for less time and reduced time for hanging? Also would they benefit if I packed them into a bit of pork bung or a smear of lard to reduce the moisture loss? At what point should you take the starting weight? Before or after the salt cure? I didn’t weight the breast to start, but it was firmer after the salt cure, and hung in the fridge suspended in a pitcher with salt water in the bottom for about 1.5 weeks. From the time of the salt cure until I stopped hanging it lost another 14-15%. It’s firm, but slightly pliable. Thanks. Basically, I’m wondering if you think that it lost enough weight. After reading all the blog posts from other Charcutepalooza folks, I would say – head for 23-25% weight loss AFTER the salt cure. The 30% noted in the Book seems to have been taken before the salting. In addition, the Magret or Moulard breasts, with a significant fat cap, lost less than those butchered from a whole (smaller) duck. (FYI, it also seems that wild ducks lose the most weight and need less curing.) Hope that helps! If in doubt, check the Charcutepalooza blogroll for other bloggers’ experience w/duck. Hi, I decided to try this with duck breasts and lamb fillets. I did forget about them for an extra day or so in the salt, but washed them off and packed them in stretchy butchers mesh instead of cheesecloth. I hung them in a bar fridge, and then went on holiday. Now- about a month later, I just got them out. They have a bit of hard surface white stuff, but nothing fuzzy on them, but they are hard as rocks! I guess they needed a big pan of water in there. They smell fine, I guess I’m wondering if they’ll be fine to eat- if I can chip any pieces off that is! Better late than never… I finally got around to posting my Duck Prosciutto! I served it simply with roasted tomato jam, a little goat cheese, some bacon jam and pita points; and between 3 people, there wasn’t a crumb left in sight. There may even have been growling. Mine didn’t seem to be firm enough, so I let it go past the 1 Week time at 50-60 degrees in my wine reefer. Now the cheesecloth is getting spots of mold. Do I pitch it out and start over? 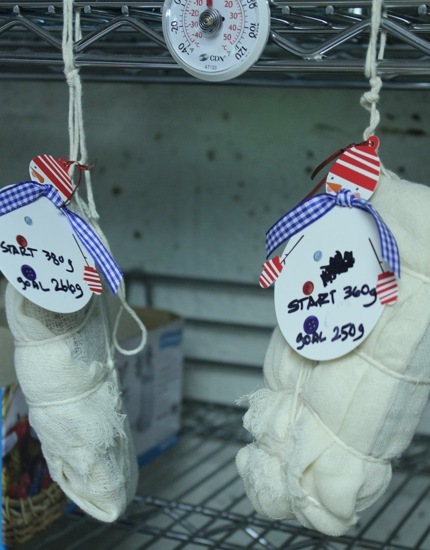 Adventures With the Duck: Duck Prosciutto | Adventures With The Pig.